Evaluated as espresso. Chocolaty, richly sweet-tart. Dark chocolate, gently scorched cedar, gardenia, almond, graham cracker in aroma and small cup. Crisp, velvety mouthfeel; richly drying finish that centers around chocolate and aromatic wood notes. In three parts milk, the chocolate takes on a dessert-like quality, grounded by hints of smoky, cedary aromatic wood. 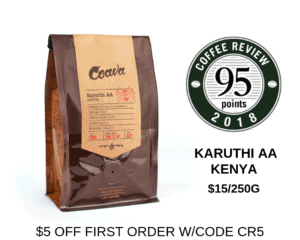 A blend of washed- and natural-process coffees from Ethiopia. Founded in 2011, Mellower Coffee is a Chinese speciality coffee roaster based in Shanghai. Visit www.mellowercoffee.com for more information. The Bottom Line: A bold, deeply chocolate-toned espresso blend with particular resonance in milk.